Ahoy there, me hearties! Get ready for hours of pirate fun with this amazing book. Load up the Golden Galleon, set sail and take the pirates off on their adventures! There are 17 pirate magnets to play with, so you can create endless combinations and make your own pictures. 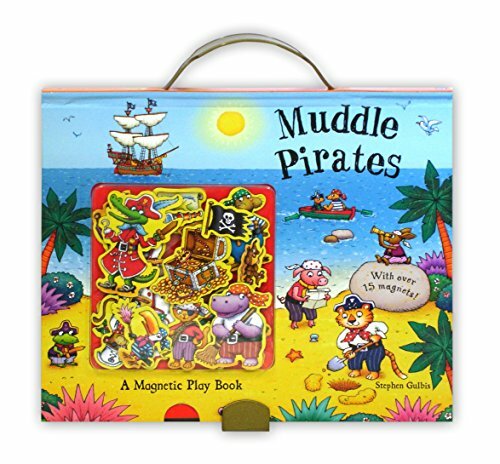 The sturdy handle lets you take your magnetic pirate book with you wherever you go! Steve studied Graphic Design at Bath Academy of Art. He has been a freelance illustrator since 1981, illustrating children's books, advertisements, book jackets and is a regular contributor to Soccerstars magazine. Steve lives with his wife and their two daughters in Banbury, Oxfordshire.